Visit http://www.mahakobees.com for many great videos. Here, we study the claim that a heat gun is faster and generally better for uncapping raw honey frames. Take a look and you be the judge! 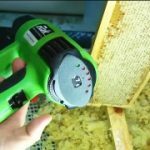 There are many ways you can extract a fresh fully capped honey frame. Generally, most smaller home based or hobby beekeepers will uncap their honey frames using a HOT knife (see our tempting closeup Beekeepers Hot Knife Uncapping Video – https://www.youtube.com/watch?v=1iqfW_0EHVw), Serrated Kitchen knife, or the Beekeeping Uncapping Fork. This is sufficient for beekeepers with 1 to possibly 50 beehives. 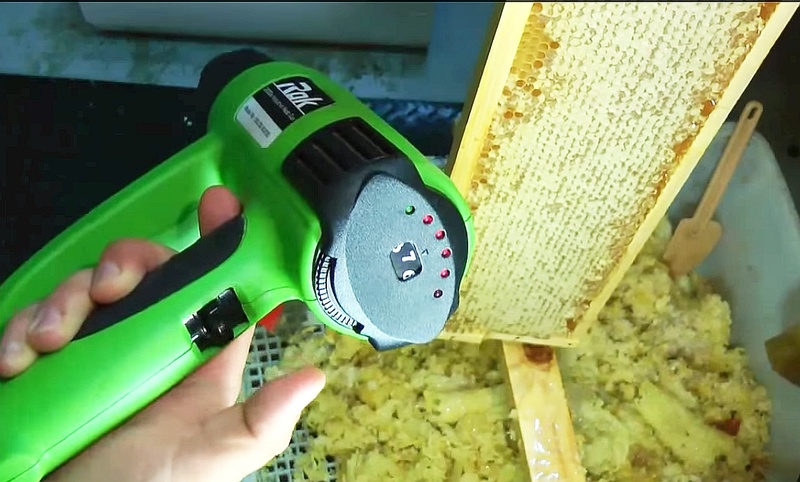 It may get too time consuming to use these methods beyond this number of hives and automation may be a wise choice with semi or fully automated spinning uncapping blades or wires. In part 2, we will review the results in more detail – post honey extraction. Make sure you don’t miss it. We hope you find our videos valuable enough to share with your family, friends, colleagues and beekeeping associations, subscribe and if you would like to let us know how we are doing, please press the thumbs up or down accordingly. Your feedback is very important to us and we appreciate your time. Small Hive Beetle is a common invader of the #Apis Mellifera or otherwise known as the European Honeybee. #SHBT is a small dark shiny black beetle that flies into the hive entrance at great speeds and therefore slip right past the guard bees. The small hive beetle is very destructive to any hive in greater numbers, but if you keep your hives strong, they will happily dedicate bee resources throughout the beehive to keep this intruder under control. The small hive beetle (#SHB) does not like the light, so it is drawn towards the darkest areas of the hive, which are typically in the corners of the beehive, in crevices of the honey frames, under the top cover and off course in the darker empty comb cells. The bee colony, if strong, will designate many small hive beetle chasers which will keep the beetle cornered in a particular area. If the small hive beetle gets into the grasp of a bee however, it will tear it to bits or grab it and fly it out of the hive. 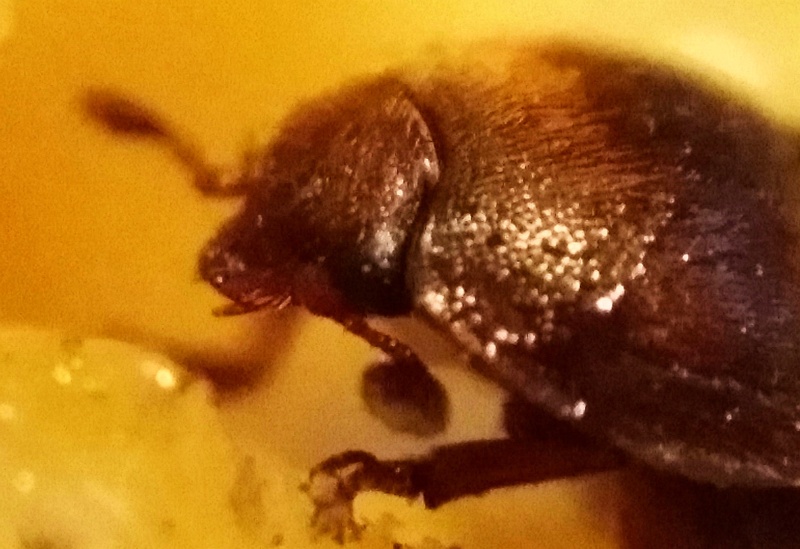 If the bees however manage to trap the beetle in a single spot long enough, the beetle will die of dehydration and starvation, and we have seen the bees even create a propolized barrier around the beetle so it cannot escape. SO why is the Small Hive Beetle such a big problem you ask? Well it lays hundreds of eggs throughout the beehive, into the empty cells, and the eggs and larvae appear to the bees as their own, so they continue to feed it well into its larvae stage, and that is when the beetle larvae will destroy the colony and the beehive unless it is strong enough to protect itself from the intrusion. Beekeepers can help the bees by firstly managing their hives in a sustainable manner and visiting the beehives often and regularly to check on their beehives during their inspections. Each visit should reveal the state of the health and strength of the colony and the beekeeper should get an indication of the small hive beetle population. In our future videos, we will look at some of the traps #beekeepers use to trap the beetles. There are many options available, both organic and natural and chemical. The small hive beetle traps also come in many various shapes and sizes, and many beekeepers have spent many years investigating and trialing a way to prevent the hive beetles entry in the first place, which it seems, is still kind of a holy grail. We would be very keen to hear from any beekeepers out there that may have successfully created a barrier to entry so please post your comments below and lets share ideas on this topic that troubles most beekeepers the world over. We hope you enjoy our videos and content, and we invite you to subscribe to our MahakoBees channel, click the thumbs up, and come back soon. We post at least once a week! Bee smoker HOMEMADE BELLOWS. Visit us for all the videos at http://www.mahakobees.com. In this installment, we review a standard bee smoker and a homemade bellow replacement we found second hand. We found leather to be one of the best commercially available materials for beekeepers bee smoker as is is durable, long lasting, flexible, relatively fire resistant, and light. However, this very unattractive bee smoker is challenging the status quo. Yes, it is homemade bellows, yes it may be cheap, and yes it may look rather ugly, but boy we found it very practical on many levels and we understand why the creator made it the way he/she has. We purchased this bee smoker from a beekeeper that was retiring, and this was an item on the pile to be dumped. We picked it up for just a few dollars, if nothing, just to see how it worked and if it was useful. And it is. We can confirm, that this bellow, although rubber, and welded rather awkwardly, works very well and is not only practical but also long lasting. This bee smoker is more than 7 years old, and has been used in the field extensively all these years. We find these benefits as explained in the video itself, it is light, comfortable, and mainly, it is easy to clean from the beeswax and propolis that usually builds up on the timber / wooden backing of a leather or synthetic leather bellow. So you cannot heat treat it, or easily remove the propolis/beeswax. This design reduces the glove/hand contact to just the thumb, and even then, the backing is metallic (i.e. steel) so it can be heat treated and scraped of with a spatula. Smoker for bees – a device that allows the beekeeper to create and send a stream of smoke to the right place. Bee smoker has a simple structure: a metal cylinder — this is a furnace, which burns coal and generates smoke, small “forge” bellows blow air into the furnace, and a stream of smoke comes out the top of the smoker. Bee smoker as a honey equipment was established in ancient Egypt and the neighboring nations of North Africa. Then it was a clay vessel with two openings, reminiscent of a turtle. They pawned burning fuel through the large hole, the air was got by mouth, and the smoke escaped through a small hole. Such a primitive device is still used by the natives of Algeria. The idea of fur smoker for bees belongs to an american beekeeper Hamet, who in 1870 gave a description of his proposed coarse and heavy instrument. For the formation of the smoke beekeeper had to push the bellows with both hands. In 1883, the famous american beekeeper Kvivbi have created a more perfect instrument, but it has a major drawback: it’s bellows were connected directly to the camera for fuel. As a result the bellows quickly burnt. Finally, the third american beekeeper Binh went further: he separated bellows from the furnace and smoker for the bees got the type that we use in the present. Certainly, the construction of bee smoker was improved over the years and now it is a comfortable, lightweight, durable, affordable device. Great contribution was made by such world-renowned beekeepers: Ruth, Lavinsky, Clark, Kenturi, Lynes, Rotshyuts, Tseringer. Let’s look at some of the structural details of bee smoker. Seemingly simple device, and yet it is thoroughly planned. It consists of two-walled cylinder, with one end it is closed down, and the other — has hinged on the hinge cover with the top of a truncated cone. This cone is a nozzle to direct the smoke. Modern bee smoker is designed so that the fuel doesn’t fall out of the hive, mesh, inserted into the lid prevents it. On the bottom it also has a mesh, which prevents contact between the fuel and the bottom, so that smoker is not dangerous to put on the painted roof of a neighboring hive. In addition, this grid is used as a ashpan for heating. Beekeeping smoker is used not only to work with the bees, but also for the putting certain medications to the notch. For these purposes, there are smokers with long nozzle.